Pinnacles National Park has around 30 miles of trails, mostly well used, in a good state of maintenance, and relatively easy to follow. The most popular trip is the 6 mile loop hike up Condor Gulch, across the High Peaks and down Bear Gulch Cave; other hikes lead to mountain peaks, along wooded valleys, and to geological formations. Hiking is the main activity in the park, as not much can be seen just by driving along the two entrance roads. 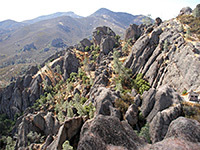 The Pinnacles National Park Map shows the location of each trail. Balconies 1 100 The Balconies are a group of volcanic ridges and domes towards the west side of the park, and provide the main destination for hikers using the Chaparral entrance. A popular path to the rocks starts at the end of the approach road, splitting into two branches at the edge of the formations; the shorter route is partly through a talus cave while the longer route (adding an extra 0.4 miles) passes large cliffs and boulders. Bear Gulch 1 280 This easy trail runs from the Bear Gulch visitor center eastwards along the wooded valley of Bear Creek to an intersection with the Bench Trail. Bench 2.4 50 The Bench Trail parallels the main park entrance road, starting in the east at the Pinnacles Campground and ending at a junction with the Old Pinnacles Trail. All the route is fairly level, along the valley floor, and some parts are wheelchair accessible. Chalone Peak 5 2,000 North and South Chalone Peak are the two highest points in Pinnacles National Park, and both are reached by a lengthy, fairly strenuous trail that starts from Bear Gulch Reservoir and follows high ridges most of the way. The last 1.8 miles (to the 3,269 foot southern summit) is not regularly maintained. Condor Gulch 1.7 1,100 One of four paths that lead towards the main volcanic pinnacles, the Condor Gulch Trail climbs a side ravine covered by chaparral vegetation typical of the lower elevations of the park, passes an overlook (after 1 mile) with fine views west to the rocky summit and south back towards Bear Gulch, before ending at an intersection with the High Peaks Trail. Juniper Canyon 1.8 1,200 The Juniper Canyon Trail links the High Peaks with the western park entrance at the Chaparral ranger station, at first climbing gently along a wooded valley, then gaining height much more steeply via many switchbacks, to junctions with the Tunnel and High Peaks Trails. Moses Spring 1.2 300 The best short hike in the national park is the pleasant trail up Bear Gulch, starting at the visitor center. 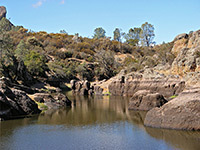 The route encounters a clear stream, impressive rock formations, many good climbing locations, and a talus cave; it ends beside the dam forming Bear Gulch Reservoir, a good place for a picnic. Running alongside part of the main path, the Bear Gulch Cave Trail descends right through the cave, with some sections that are completely dark and require a torch. North Wilderness 7 1,000 The unmaintained, little used trail into the northern wilderness section of the monument follows creekbeds most of the way, though rises to cross several ridges on the western side. 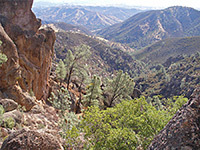 The east end is at a junction with the Balconies/Old Pinnacles trails, while the west trailhead is at the Chaparral ranger station. Old Pinnacles 1.9 300 Running alongside the West Fork of Chalone Creek, the Old Pinnacles Trail forms the shortest route to the Balconies area if starting from the east, as well as linking with the North Wilderness Trail. The path is fairly level and well shaded but not especially interesting. Rim 0.4 80 This link path connects the High Peaks Trail with Bear Gulch Reservoir and the end of the Moses Spring Trail, traversing a grassy hillside above Bear Gulch. South Wilderness 2.9 200 Almost all of the South Wilderness Trail is along the meandering valley of Chalone Creek, passing through patches of woodland beneath rolling hills, without any volcanic scenery. 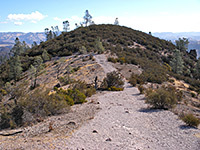 The park boundary is reached after 3 miles though the route continues, linking with other paths through the Gabilan Mountains. The hike begins along the east park road, not far beyond the entrance station. Tunnel 0.6 300 Providing a slightly less scenic alternative to the steep and narrow section of the High Peaks Trail, this path also crosses the main area of rock formations, and in one place passes through a short artificial tunnel.